As it was announced today, former Secretary of State Hillary Clinton will be running for president in 2016. She has a degree from Yale Law School. She was first female Senator of New York. In her time as First Lady, she championed various health care and social service initiatives. Yet when her name is brought up, it's likely that one of the first words that comes to mind at the mention is "pantsuit." 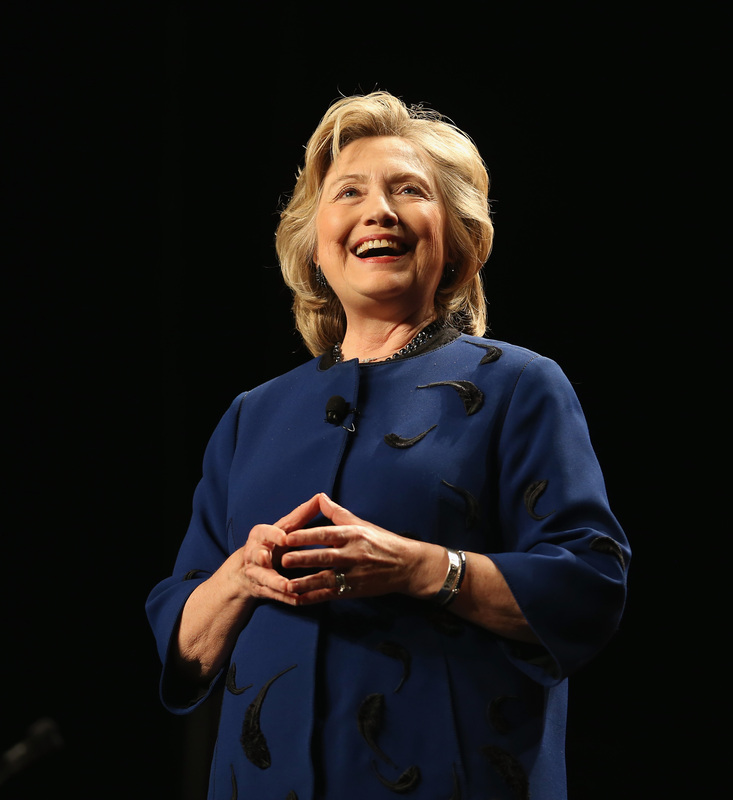 It's no secret that Hillary Clinton is famous for her professional-looking two-piece sets. There's a popular meme of Clinton's pantsuits forming all the colors of the rainbow. There's a store in Kosovo devoted entirely to selling her signature blazer-slack combos. The jokes and commentary on her wardrobe, makeup, and hair are extensive. However, in the upcoming election, I'm crossing my fingers for people to just STFU about what Clinton is wearing. One of the biggest reasons we have a responsibility to chill out about Hillary's wardrobe is a pretty obvious one. Except in the event of the occasional beige suit (looking at you, Obama), the dialogue around political fashion generally ignores men, although politics is still a male-dominated field. Most people can correctly identify this fact as some sexist BS. Granted, it's difficult to single a person out for their fashion choices when they're wearing a uniform, as male politicians essentially do. Most of the men who comprise the Senate and the House of Representatives adhere to the political dress code of a blue suit, a white shirt, and a tie. Why? The suit is the sartorial manifestation of authority and privilege. It's an outfit that is intended to allow ideas to speak for themselves, without the distraction of fashion — a petty frivolity reserved for the first ladies, who needn't worry themselves with big boy issues. But for the women of Washington, an outfit can make or break your image. Think about it. First ladies become icons though their fashion choices. Those choices are expected to make a first lady look aspirational and accessible at the same time. Also, they have to satisfy a popular idea of "femininity," so you better find something that shows off that figure. But be warned! If you're seen doing the requisite leg work for that image by going shopping, it's also not great PR. Then, there's the case of power dressing. Or as men call it, dressing. In the event that a woman in public office — Hillary for example — wears one too many power suits, she's seen as not being feminine enough. Owing his opinion to changing styles of the day, Yahoo Style Editor-in-Chief Joe Zee predicted that "she [Clinton] won’t be wearing that baggy non-fitted suit anymore, it’s going to be something that’s a lot more tailored and a lot more feminine." In my opinion, Zee is ignoring is the fact that Hillary has just been wearing the political office uniform for years. She just happens to have different reproductive organs than the majority of her co-workers. As it has been for the entirety of American history, politics remain a man's game. Out of the 100 U.S. Senators currently in congress, 80 are men and 20 are women. As a woman, if you don't wear some conceivable version of that uniform, odds are that your ideas won't be taken seriously. In order to be given he same amount of respect as her counterparts, Hillary already needs to work twice as hard. On top of that, she needs to "look the part," which means wearing a suit. However, if that suit doesn't show off her body, she will be viewed as a failure to her gender — a woman who doesn't know how to please the male gaze. The Hillary Clinton fashion effect evidences the huge disparity between how we judge men and women according to how they dress. If a female politician doesn't know how to dress like a lady, she's lampooned, shamed, and her ideas are ignored. However, if she wears "distracting clothing" or spends too much money, she's seen as silly. All men need to do, however, is show up somewhere in a suit and inhabit the authority that society has bestowed upon them. Thankfully, it seems like people have been recognizing the inherent sexism in how Clinton's personal style has been discussed in the past. Last year, Jimmy Fallon made a cheap joke about Clinton's pantsuits, which was openly booed. There have been many thoughtful essays on the misogyny inherent in the media commentary concerning Hillary's style. As we prepare for what is sure to be an inevitable onslaught of articles critiquing Clinton's outfits, let's try to remember the following truth. Dress prejudice is just another form of culturally ingrained sexism that keeps women down.